Whenever the No. 12 Stanford women’s golf team is brought up, the conversation almost immediately centers on Mariah Stackhouse—and for good reason. The budding sophomore star was the team’s lowest scorer in seven of her team’s 11 tournaments last year and keyed the Cardinal’s 24th place finish at May’s NCAA Championships. Somewhat lost in the Stackhouse spotlight, however, was her classmate Lauren Kim. 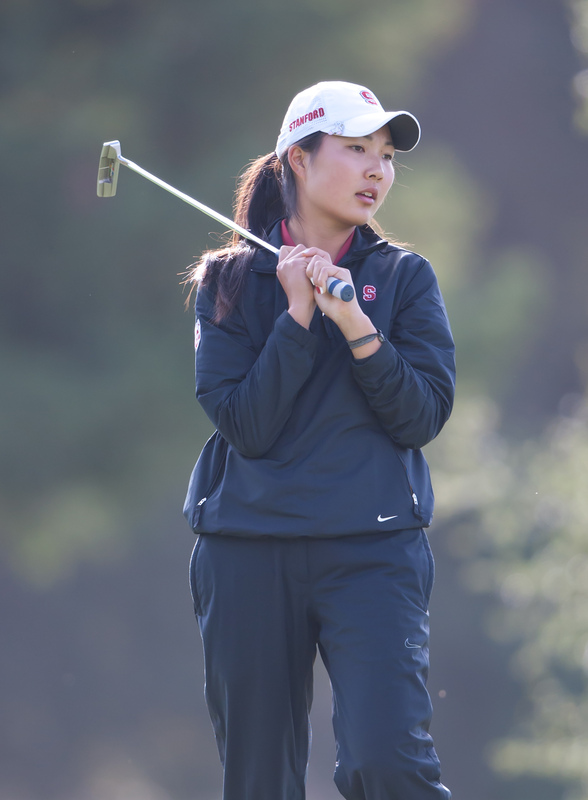 But after a dramatic win at August’s California State Women’s Amateur and leading her team to an impressive T-3rd placing at the Windy City Collegiate Classic yesterday, Stanford may yet have another young golfer ready to lead it to the promised land. Despite finishing T-4th individually at Windy City—held at Northmoor Golf Course in Highland Park, Ill.—Kim had a rather inauspicious start to her tournament. She recorded two bogeys and a double bogey in her first nine holes of Monday’s opening round en route to carding a 4-over 75. While the Los Altos native admittedly struggled with her rhythm and ball striking, she made an about face in the afternoon frame. Her 3-under 68 was the second lowest round of the entire day, and it would’ve been even better had it not been for a two-stroke penalty on the par-5 3rd for hitting the wrong ball. Kim maintained her momentum into yesterday’s final round, birdieing three of her last five holes to catapult from T-14th place to T-4th in the individual standings. Her cumulative score of 1-under 212 was four shots behind tournament winner Lindsay Weaver of No. 10 Arizona. In doing so, she was the lone Cardinal player to finish under par. Also turning in a solid tournament was Mariko Tumangan, continuing her resurgent play from the end of the 2013 spring season. The junior was her team’s leader after 18 holes and shot rounds of 70-73-72 on the par-71 course to finish in a tie for seventh. Stackhouse was Stanford’s third player in the top 10, recording a cumulative score of 3-over 216, good enough for T-9th in the individual race. “Mariko and Mariah showed that once again they are the core of our lineup,” Walker said of her second and third scorers. “Both finished in the top 10 and played very well from tee to green.” She also was “pleased with our progression” regarding the team’s short game, an area the team has devoted significant time towards. In the team competition, Stanford improved its standing in each successive round. In fifth place after 18 holes, the Cardinal fired the second round’s third-lowest score with a 4-under 280—seven shots better than its morning effort—to put the team in fourth. And in yesterday’s final frame, the squad notched the lowest round of the day, moving in a tie for third with Arizona. Stanford next plays at the Edean Ihlanfeldt Invitational in Sammamish, Wash. next Tuesday and Wednesday. The team recorded a third-place finish at the event in 2012.